I love my Book Club. I think everyone needs a book club. Our activity for December was a celebration- we watched the long version of Pride and Prejudice (the only way to go if you are watching a film version of P & P) and we all worked on various projects- wrapping, Christmas card making, finishing gifts, etc. It was such a nice way to spend an evening. We tend to keep busy during book club- with us it is ok to crochet a scarf while discussing plot line, or to craft some personalized magnets while talking about character development. Our hands are at work while we are talking and enjoying each others' company, much like would have been true for the women of our past. Why doesn't everyone do this anymore? I suppose that part of the reason is that our work has changed. Typing on a laptop is not as conducive to conversation as mending a hem. My friend Betsy reflected on our busy hands towards the end of this post. I appreciated her ideas about handiwork, face to face communication, and how we can bring back a bit of the personal touches that our world has seem to lost. 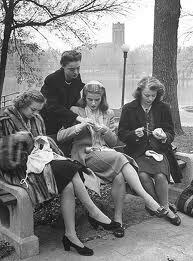 I, for one, am all for bring back sewing circles, quilting bees, canning parties (or the modern version thereof). Let's make our work a celebration of life and friendship and family. Let's cherish the people surrounding us and invest ourselves in them more. Let's make sure that even when our hands are busy that we are focused not on the object of our work but the recipient of the work. Busy hands, and full hearts. Girl - you are cranking out these posts quicker than I can keep up! Love the stories! What a happy post. And what a brilliant idea it is. It is almost as if we do stuff at home while chatting and talking with our family members. So casual yet so personal. I like book clubs, it is like having a family sharing a similar hobby or interest.